Heisenberg’s uncertainty principle is the stuff out of which some of the best modern legends are made, such as the ill-fated Schrödinger’s cat, which is neither dead nor alive but exactly the opposite, or the fantastic stories about quantum improbability drives, which made the infinite monkey theorem to be real for a fraction of eternity only to vanish again (among many other infinitely improbable effects). However everything has an end and that seems to be the case with the uncertainty principle as well. Canadian researchers have managed to prove it false in some circumstances, circumstances theorized already in 2003 by Masanao Ozawa but not experimentally confirmed until now. While there is a rigorously proven relationship about uncertainties intrinsic to any quantum system, often referred to as “Heisenberg’s uncertainty principle,” Heisenberg originally formulated his ideas in terms of a relationship between the precision of a measurement and the disturbance it must create. Although this latter relationship is not rigorously proven, it is commonly believed (and taught) as an aspect of the broader uncertainty principle. Here, we experimentally observe a violation of Heisenberg’s “measurement-disturbance relationship”, using weak measurements to characterize a quantum system before and after it interacts with a measurement apparatus. Our experiment implements a 2010 proposal of Lund and Wiseman to confirm a revised measurement-disturbance relationship derived by Ozawa in 2003. Its results have broad implications for the foundations of quantum mechanics and for practical issues in quantum measurement. In other words, the researchers managed to measure a photon with a very weak interaction first and then measure the photon regularly again, producing the same result. This means that the photon was not altered by the first measure, what surely opens many possibilities for both theoretical and applied physics. The elusive subatomic particle, dubbed “the God particle”, or at least something that looks a lot like it, has been finally found, according to an announcement by the European Organization for Nuclear Research (CERN), whose particle accelerator, the Large Hadron Collider (LHC), spans many kilometers underground the French-Swiss border near Geneva. “We observe in our data clear signs of a new particle, at the level of 5 sigma, in the mass region around 126 GeV. The outstanding performance of the LHC and ATLAS and the huge efforts of many people have brought us to this exciting stage”, said ATLAS experiment spokesperson Fabiola Gianotti, “but a little more time is needed to prepare these results for publication”. “The results are preliminary but the 5 sigma signal at around 125 GeV we’re seeing is dramatic. This is indeed a new particle. We know it must be a boson and it’s the heaviest boson ever found”, said CMS experiment spokesperson Joe Incandela. “The implications are very significant and it is precisely for this reason that we must be extremely diligent in all of our studies and cross-checks”. While the implications of this discovery are yet to be refined there is almost no doubt that it will strongly affect our understanding of nature confirming the theoretical set of the so-called Standard Model of particle physics. 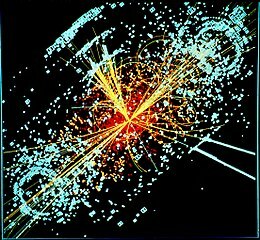 The unification theory or Theory of Everything (ToE), which would fuse particle physics and space-time (and gravity) physics described in Einstein’s General Relativity is still out of our immediate reach, however consolidating the Standard Model should provide more solid basis for such efforts. The Higgs Boson is involved in the Higgs mechanism: the why behind particle mass. Robust australopithecines were indeed relatives, shows CT scan ··> SD. Neanderthals also exploited seafood resources, as early as H. sapiens ··> El Neandertal tonto ¡qué timo![es]. Looters and bureaucracy destroy a Solutrean site in Andalusia (Higueral-Guardia cave). Sadly enough, it was a lot easier for looters to access the unprotected cave illegally than for archaeologists to do so legally ··> Pileta de Prehistoria[es]. What more classical troglodyte imagery than skulls on sticks? Sadly archaeology had never produced such artifacts… until now: Epipaleolithic Swedes had them ··> Pileta de Prehistoria[en]. Fascinating ‘Nazca lines’ found in Arabia ··> Live Science. 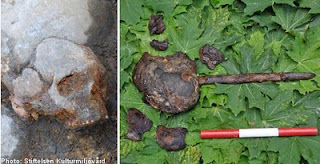 More Neolithic remains from Yesilova (Izmir, Turkey) ··> Daily News. Remember the first pampooty shoe (or abarka) found in Areni 1 cave (Armenia)? It has now also produced a skirt ··> News.am. 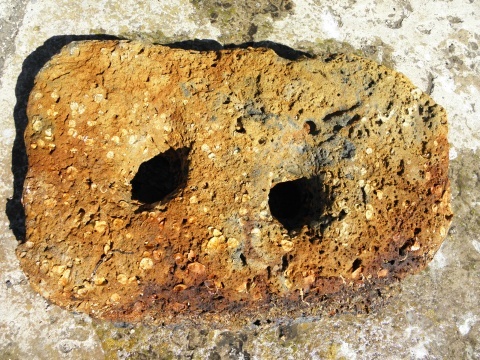 Bronze Age’s stone anchors from the Black Sea ··> Novinite. Fscinating 3D reconstructions of Stonehenge, Woodhenge, etc. ··> The Heritage Journal. Cahokia Mounds researched in some depth finally ··> BND. Clay disks from Alaska ··> Art Daily. Bronze Age haploid DNA from North China yields no surprises (mtDNA: D4, D*, M7c, A4, F1b, G1a, M9a, M10 and M8z; Y-DNA: N1c and O3) ··> Dienekes. First Aboriginal Australian genome sequenced ··> Dienekes. 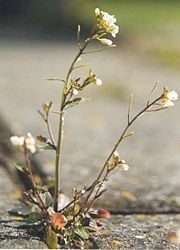 Epigenetic evolution: Arabidopsis thaliana does it all the time, what about humans? ··> SD. Speed of light may not be the ultimate speed limit: neutrinos found going faster. It also challenges the unidirectionality of time ··> Al Jazeera, BBC. 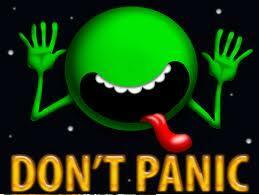 Dark matter challenged by dwarf galaxies ··> BBC. Special thanks to Stone Pages’ Archaeo News section. This is so weird and intriguing that I can’t but make a quick comment on it. Two US scientists, Jonas Mureika and Dejan Stojovic, are proposing a radical rethink of what we understand as the basic physics of our universe: they suggest that, at the Big Bang, the Universe had only one dimension (like a line), acquiring then two dimensions (plane) and then three (space), and probably soon a fourth (if not already). This radical rethink seems to have been pushed by the advances (and lack of them) in the fields of Physics and Astrophysics in the last decades, when questions have been piling up and convincing answers have been lacking instead. These problems include the fundamental incompatibility between gravito-centric General Relativity and particle-centric Quantum Mechanics, the mystery of the Universe’s accelerating expansion (which seems to demand extra dimensions) and serious issues with the elusive (and maybe non-existent) Higg’s Boson. By reflecting this new proposal I do not mean to adhere to it but I do like the principle they begin from: maybe something fundamental is wrong in the way we think Physics, so exploring radically new venues may be the way out of an otherwise unsolvable problem. They are thinking out of the box and that is something I really like and that often brings real solutions in all fields. The new theory has been published in the Physical Review Letter (pay per view) and is also discussed in its essentials at Science Daily.